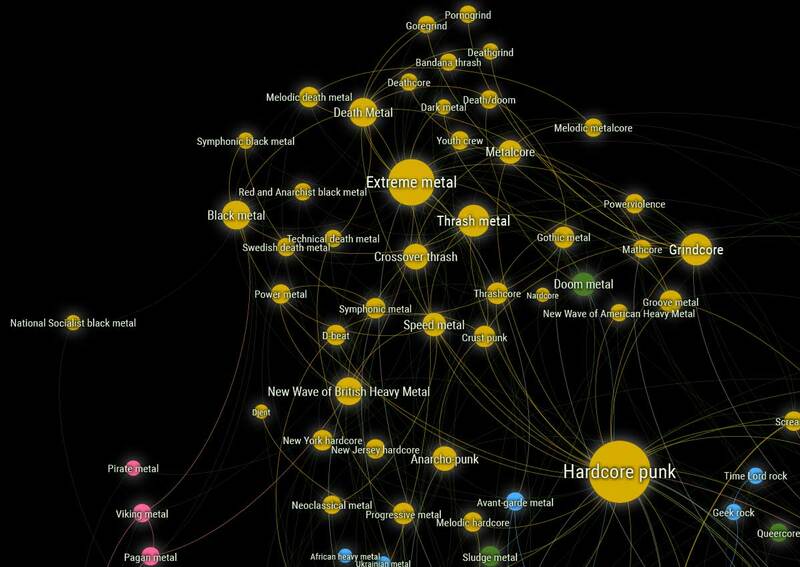 The All Music Map 2016 is a data visualization of music genres and their connectedness. 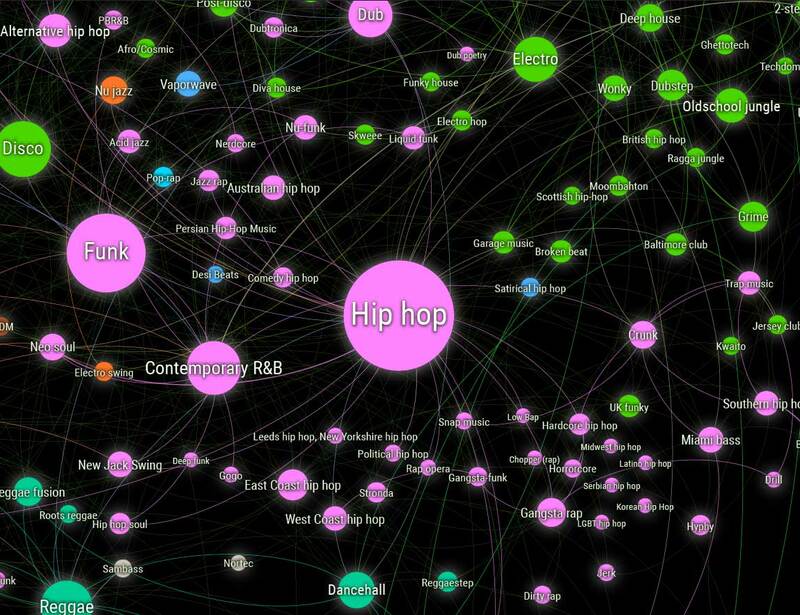 It connects 770 genres of music using 3,481 musicians, bands, DJs, albums, and labels whose works are categorized with multiple genres. Essentially, this is a family tree of music. 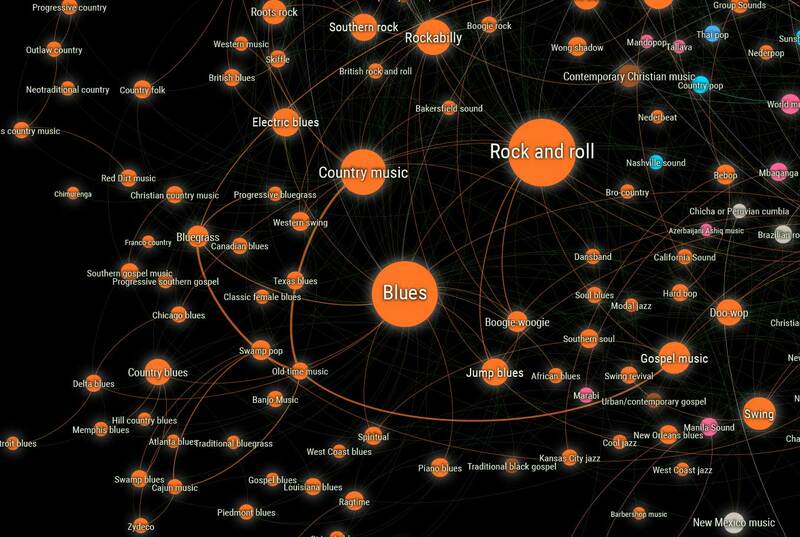 Music genres are often influenced by (or themselves influence) other music genres, such as Blues influencing Rock. Often a genre was influenced by multiple genres, as with fusion genres (e.g. Tech House), but not always, as with subgenres (e.g. Persian Hip-Hop). These influences create the basic family tree, although because many musicians are influenced by genres across many eras, the tree is not a simple hierarchy. The map really takes shape thanks to the connections. 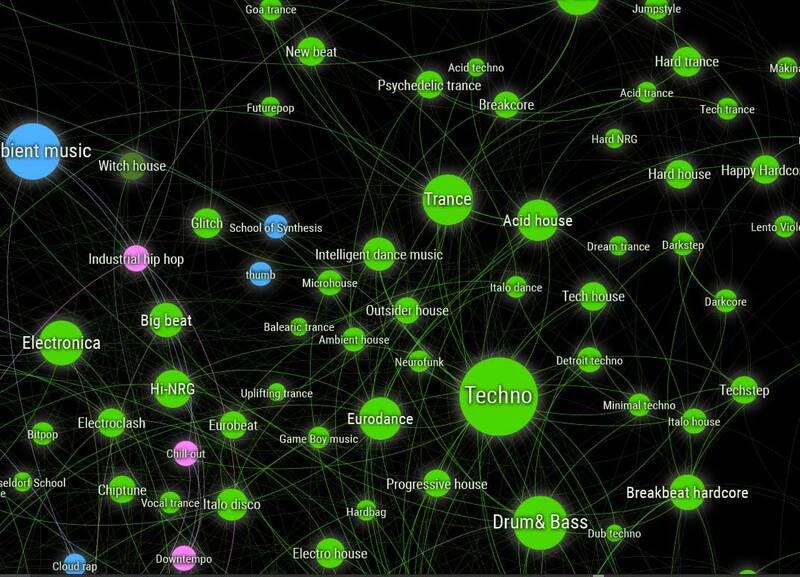 Each line connecting two genres represents many musicians, bands, DJs, albums, and labels, each of which have been categorized with both genres (and others, perhaps). 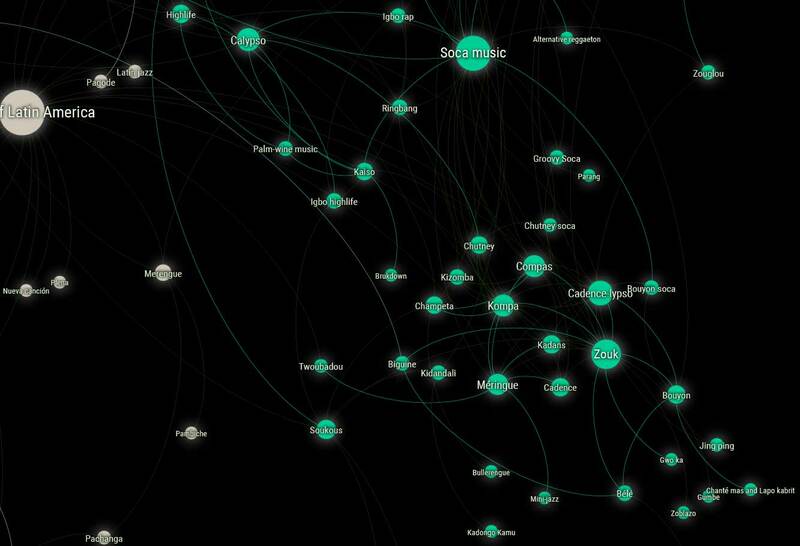 More music & musicians equals a stronger connection between genres (I think information network types call this “force direction”) and closer placement on the map. Classical Music appears nowhere, nor does Baroque, Modern Classical, 20th Century Composer, or other related or contemporary variations. And there were other significant omissions: any genres of early electronic music (a favorite of mine), Musicals, Soundtracks, and more. Some of these, like Soundtracks, can be explained in that they don’t really describe a style of music. This partially explains Classical since many eras of classical music are often inferred by “Classical Music”, but also classical is categorized somewhat differently in the data world of Wikipedia and not picked up when I search via influences and subgenres. In musicology-speak, classical is art music, and this map is only of popular music — read this section of Wikipedia’s Music Genre article for more. For what it’s worth, I also created a “long-form” variation of this map that includes classical and other omissions, resulting in over 2,000 genres. However, it’s less cohesive and less satisfying than this version. Hopefully I’ll get a refined version I’m satisfied with in the future that I’ll publish and share, along with other variations I’ve tried such as one showing all genres of creative work (music, film, software, literature, etc.). Big thanks to the original inspiration Ishkur’s Guide to Electronic Music, and to Ishkur for not updating it so I’d have to make my own. 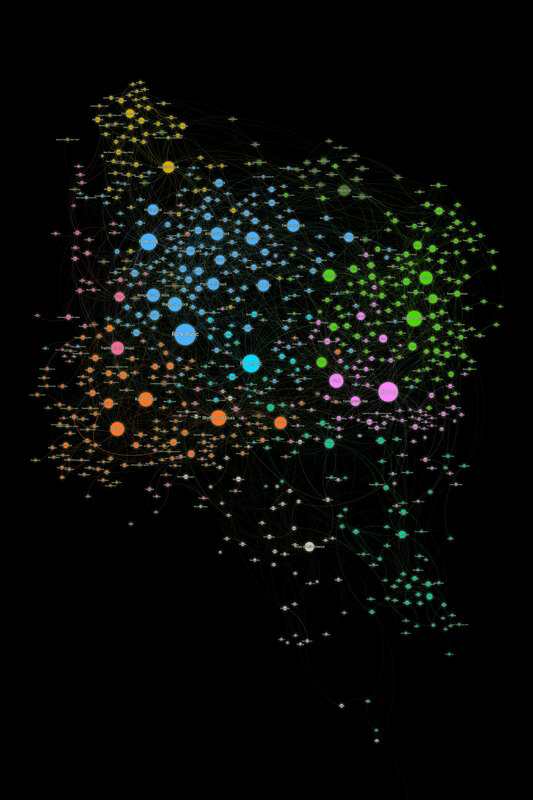 Also thanks to Hirst’s OUseful.Info blog, especially his Mapping Related Musical Genres on Wikipedia/DBPedia With Gephi article. 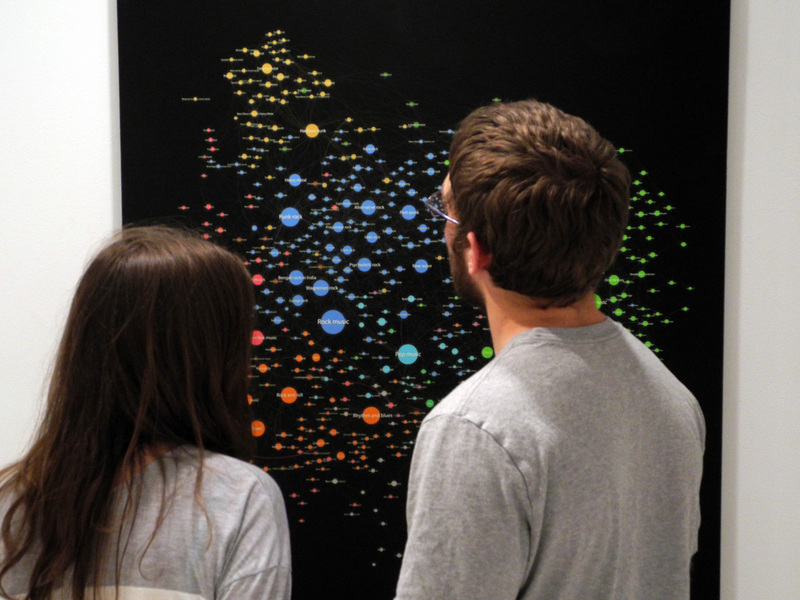 This data visualization created largely through Gephi though the digital print was beautified in Adobe Illustrator first. Data from Wikipedia was retrieved via DBpedia during March 2016.